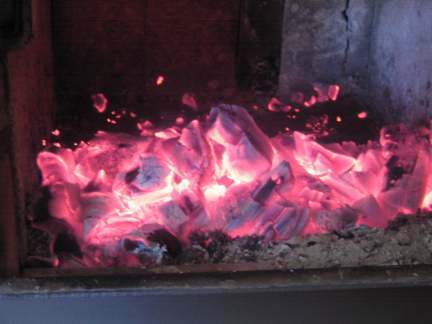 In cold weather the coal bed can build up so there is hardly room for more wood, and still you're freezing. Here's the solution. 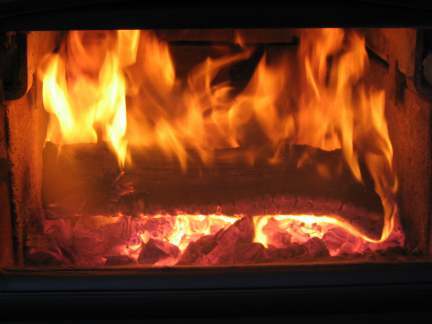 Big coal beds are a particular problem with EPA certified non-catalytic stoves because their insulated fireboxes and high temperatures tend to cook out the volatile gases quickly, leaving a big load of charcoal. This isn't much of a problem during moderate weather because the coal bed can do an adequate heating job. But when the weather gets very cold, a coal bed is not enough to heat a house and the big coal bed gets in the way of adding more wood. 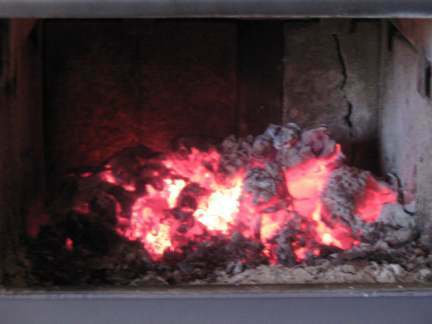 The solution is to rake the coals towards the primary air inlet, place one log on the pile of coals and burn it fast. 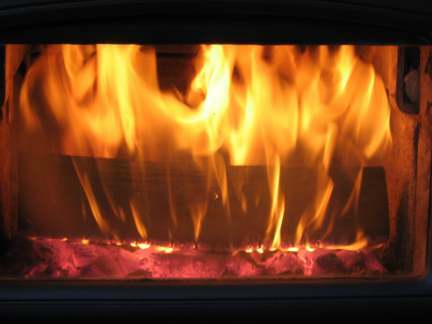 The primary air on almost all modern wood stoves is the airwash for the glass, so rake towards the glass door. Here is a huge coal bed created during -20°C (-2°F) weather. Note that one of my firebricks is cracked. At any given time there is at least one cracked, but I don't worry about it unless it starts to fall out, at which point I replace it. Rake the charcoal towards the door. It seems that the radiation off the fire plays havoc with the focus on a digital camera, but you get the idea. Make a pile of charcoal just inside the loading door. 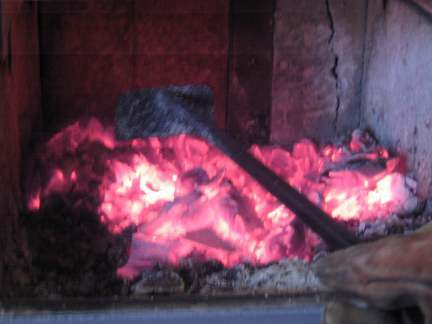 Place one smallish split log right on the charcoal and turn the air control up full. We usually recommend placing at least three logs at a time on a coal bed, but this is the exception to that rule. In this case the coal bed is so big that there is no problem getting rapid ignition and good combustion. Here is that one log burning fast. 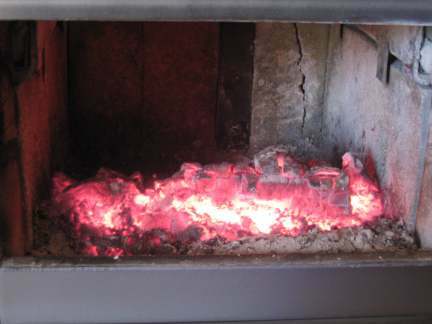 This technique not only consumes the coal bed, but it also makes lots of heat, which is what we're looking for in cold weather. Here is that log burned down to charcoal. Notice that the coal bed is also smaller. With very big coal beds, you may need to do the single log routine two or three times to get the coal bed down. Here is the second log placed. 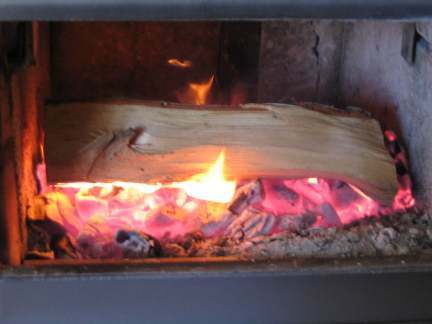 Here is the second log burning. 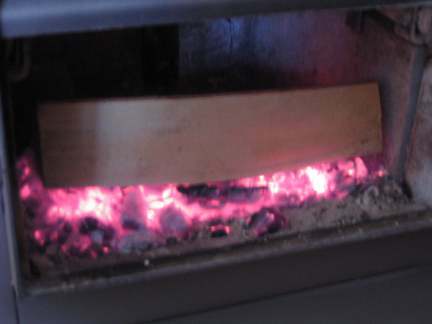 Once it burns down to charcoal, the coal bed will be small enough that the stove can be loaded normally. Huge coal beds can be frustrating, but if you use this technique they'll never be a problem again.